It is the presence of feathers that is unique to birds. Other animals can fly, other vertebrate animals have beaks or bills, other vertebrate animals lay eggs, but no other living animal has feathers. Feathers are highly modified scales. 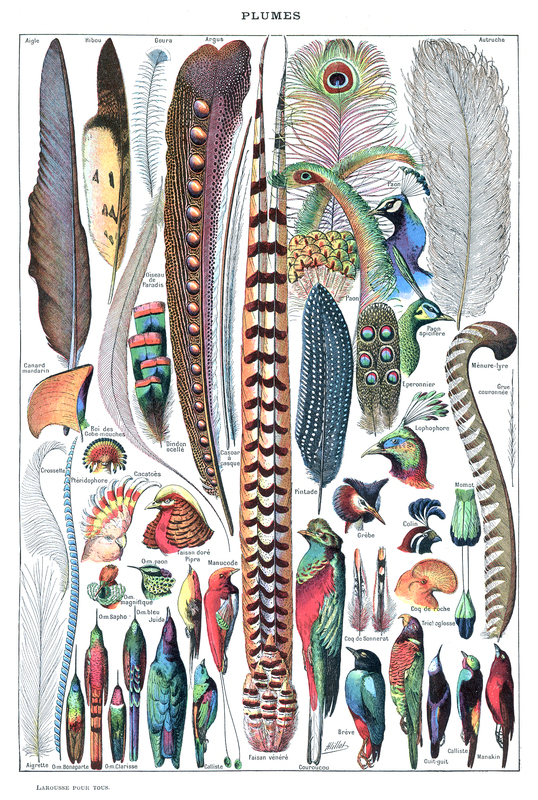 There are different types of feathers that have different uses. Courtship and mating displays – these vary tremendously from species to species. The largest feathers are contour feathers. These give the bird its shape and color and include both the flight feathers, called remiges, and the tail feathers, called retrices. Figure 6.48: The image above shows the parts of a contour feather. Vane: the flat part of the feather on both sides of the shaft; the vane is made up of barbs that hook together. Rachis: the main shaft of the feather. Barb: a series of branches, or barbs, fused to the rachis; the barbs themselves are also branched and form the barbules. Afterfeather: the downy lower barbs of a feather. Hollow shaft, Calamus: at the base of the feather, the rachis expands to form the hollow tubular calamus (or quill) which inserts into a follicle in the skin. 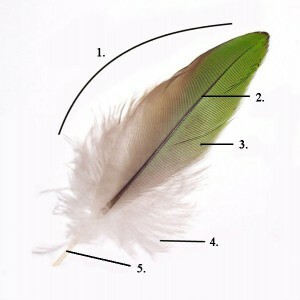 There are two basic types of feathers: vaned feathers which cover the exterior of the body, and down feathers which are underneath the vaned feathers. Owl feathers have unique adaptations to allow virtually silent flight- a real advantage for a predator. 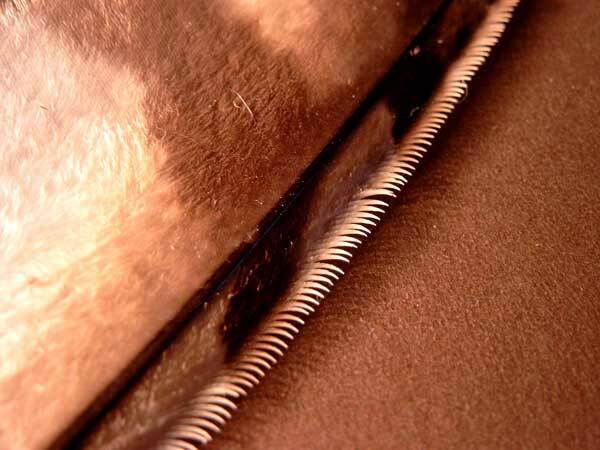 Figure 6.49: The serrations on the leading edge of an owl’s flight feathers reduce noise. The most unique adaptation is the comb-like or fimbriate (fringe-like) leading edge of the primary wing feathers referred to as flutings or fimbriae. When a typical bird flies air rushes over the surface of the wing, creating turbulence, which makes a gushing noise. With an owl’s wing, the fimbriae breaks down the turbulence into little groups called micro-turbulences. This effectively muffles the sound of the air rushing over the wing surface and allows the owl to fly silently. There is also an alternate theory that the fimbriae actually shift the sound energy created by the wingbeats to a higher frequency spectrum, outside of the auditory range of most creatures – including prey and humans. Silent flight gives owls the ability to capture prey by stealth, and also allows the owl to use its hearing to locate potential prey. This adaptation is not present on some owl species that hunt in the daytime. For more on feathers, refer to The Wonder of Bird Feathers from Earthlife.net and the following video from National Geographic (note: video will start with a commercial): Peacocks. The number of feathers a bird has depends very much on its size and where and how it lives, in general a third of a bird’s feathers are on its head. The bird with the least feathers is the Ruby Hummingbirds Archilochus colubris with only 940 feathers in total. The bird with the most feathers is the Whistling Swan Cygnus columbianus which can have as many as 25,000 during winter. The longest feathers in the world belong to an ornamental chicken bred in Japan in 1972, this specimen had tail feathers 10.59m or 34.75ft long. The longest feathers of a wild bird belong to the Crested Argus Pheasant Rheinhartia ocellata which commonly reach lengths of 173cm or 5.7ft.